A couple of weeks ago, I had lunch with a dear friend of mine I hadn’t seen in years. Over a bizarre series of events, God brought us back in contact with each other, and I couldn’t wait to catch up on all that was going on in her life. As we visited, she began opening up about the struggles she was facing. It was soon obvious to both of us that she was at a crossroad. As a fellow believer in Christ, I asked her where her faith was in all that was going on and if she had prayed over these issues. Her response was heartbreaking. This is what she told me. I don’t think I believe in religion anymore. Over the past few years, I have seen more love in non-Christians than Christians. In fact, most of the Christians I know are full of anger, hate and self-righteousness. Honestly, I just don’t know if I believe in a Heaven where these self-proclaimed Christians are going to spend eternal life just because they believed in Jesus. I’m beginning to question if I believe in Jesus at all anymore. Wow. I was speechless. She proceeded to tell me of some of the encounters she had experienced with her Christian family and friends. As I listened, I was shocked at what she shared, and quite honestly, sickened from the words and actions of my fellow brothers and sisters in Christ. God, in His infinite wisdom and impeccable timing, had brought this friend back into my life, and when she made these statements, I knew exactly why. You might think it was for me to win her back to Christ (and eventually, I pray that it is), but as I sat there, I realized God was, once again, molding me in my Christian walk. I began to question if I was showing the true face of Jesus to those around me? Is love, acceptance and forgiveness what I lead with in my witness to others or do I come across as arrogant, close-minded and unloving as the Christians she had been encountering? Was I, in fact, a cheap imitation of Christ? As followers of Jesus, we are called to show the world around us glimpses of Heaven. We are to strive to live differently, while at the same time, recognizing we too are sinners. We are to celebrate being a child of God, while acknowledging so is everyone else. We must concede that God loves each of us equally, and He is desperate for each of us to ultimately come home to Him. Yes, I am called to hold those around me accountable, but I am also called to do this with love as my motivation – not my selfish, human inspired agenda! As sinners saved by the precious blood of Christ, who are we to throw stones in the first place? Remember the adulterous woman in the temple courts? Jesus point blank asked “If any one of you is without sin, let him be the first to throw a stone at her” (John 8:7) Yes, Jesus held people accountable. Yes, He was angry at the sin He encountered. Yes, He was frustrated with this fallen world. But, His love overpowered any other emotion He was feeling, and Jesus tells us to do the same – “A new command I give you: Love one another. As I have loved you, so you must love one another. By this all men will know that you are my disciples, if you love one another” (John 13:34-35). “Whoever claims to live in (Christ) must walk as Jesus did… anyone who claims to be in the light but hates his brother is still in the darkness” (1 John 2:6,9). Oh Lord, please don’t allow me to live in the darkness – help me to truly understand it is love that wins others to Christ! I will be held accountable one day – for my words, my actions, and ultimately my servanthood to our Mighty King. I pray on that day He will say the words of my mouth and meditations of my heart were pleasing in His sight (Psalm 19:14), but more importantly, I pray He will say He knew me because I looked like His Son – I loved like His Son – I exuded peace like His Son – I practiced patience like His Son – I forgave like His Son – I was gentle and kind like His Son. This is how He will recognize each of us. This is how others around us will recognize Him. As a family of believers, let us remember, we are always giving glimpses of His wonderful glory – today, may we grasp the power this responsibility gives us in leading others to Christ or away from Him. Thank you Lord today, for faith, hope and love – help me to remember the greatest of these is love (1 Corinthians 13:13), and help me to always lead with that. God had me thinking about the concept of love recently. I don’t know if He used last week’s date of February 14th to peek my interest in the topic or if it was just time for me to reflect on how His abounding love has transformed my life. Regardless, as the hoopla of Valentine’s Day came and went, I realized just how much my image of love has changed. Believe me, it’s been a long, hard lesson for a self-confessed “love junkie” like me to learn. Let me explain. For many years, I looked to those around me to fill my need for love. I would crave the attention, adoration, or affection of my family and friends; then, however much I received, or didn’t receive, of this love would determine my emotions and subsequent actions. I don’t want to sound dramatic, but it was like an addiction – one that left me looking to anyone for my next “fix.” I found myself in a self-centered cycle of sin which, looking back, brought with it many self-inflicted scars. You see, the pressure I put on those around me (in particular my spouse) to satisfy a need only my Heavenly Father could fill was like putting a square in a round hole – as much as I tried to make it fit, as much as I wanted the love of those around me to fill me up, I was always left with some empty space. This emptiness would inevitably leave me looking for someone to blame. Praise God, after much soul searching and mis-guided finger pointing, I found who the guilty party was – me! I had placed myself in a position where my so-called “love tank” would never get filled, and I knew I needed to make some changes. Our compassionate God gently spoke those changes to me through His precious Holy Word. 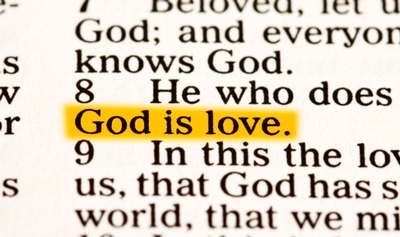 As Believers, we know God is love (1 John 4:8), and we were created in His image (Genesis 1:27). Therefore, to experience love is an essential component to our being. In fact, even a study in Forbes magazine called “The Science of Love” concluded love was more of a “primal drive akin to hunger, than it was an emotion.” Knowing this, what happens when we run on empty in that department? I mean, let’s face it, we are sinful people having relationships with other sinful people, and, on top of that, we live in a sinful world – most likely, no one is getting their fill of love purely from those around us. The fact is, while we were made for love, we were made specifically for God’s love, and only He can fill our alleged love tank. Don’t get me wrong, as humans, we can enjoy, esteem, and cherish the love of our family and friends, but we are not to rely on it. We must, as our Father tells us through the disciple John, “rely on God’s love” (1 John 4:16) alone, and trust me, it’s an incredible, unconditional, individual type of love! But, there’s even better news – the only prerequisite God requires of His children to experience His amazing love is for us to open up our hearts to Him through our time and cultivate a more intimate relationship. After all, we can’t truly receive the love of someone without knowing who they are. The apostle Paul tells us we must “be rooted and established in love (or God) so that we may have the power to understand how wide and long and high and deep is the love of Christ” (Ephesians 3:17-18). We can’t grasp the love of our Savior without developing roots where it can grow. Rest assured, when it grows, you are blessed with the most incredible taste of true love – a love which surpasses this life into eternity. How is your love tank these days? Are you trying desperately to fill it with the love of those around you? Or have you found, the only true spiritual gas station for your tank? I have to be honest, while my image of love has changed over the years, it continues to be a daily struggle for me to look only to God to fill me. My flesh can be strong. Without consistent redirection, it can guide me to the wrong fueling station, leaving me with that familiar feeling of emptiness. Where are you fueling up? Do you need redirection? Have no doubt, there is a station close by where your love tank can be filled, and its Attendant is always waiting with a surplus of fuel!